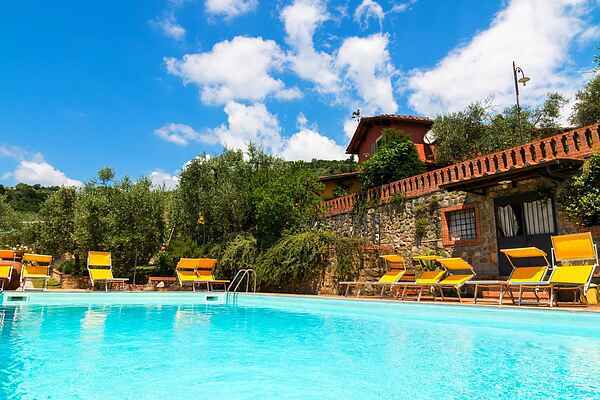 This farmhouse is located in the heart of Tuscany at a scenic location in the countryside. It is the perfect place to try authentic products from this bountiful region amidst the unspoilt natural setting and charming atmosphere of this stunning landscape. The farmhouse produces wine and has a small, quaint restaurant, where guests can arrange to try dishes from traditional Tuscan cuisine. Guests have access to a gorgeous, panoramic pool, fully outfitted with tables, chairs, sunshades, and outdoor showers, as well as a communal area, which is where the laundry room and a large terrace can be found. For relaxation, guests can enjoy a spa with Turkish bath, Jacuzzi and massage shower and a sauna. The owners are happy to have guests take part in production and to explain how everything is cultivated, but, most importantly, to taste it all, too: wine, grappa, Vin Santo, and limoncello. It makes for quite a bit of fun at the farmhouse! We usually give our guests a bottle of biological wine from our own production and we offer a tour of our cellar with our products (we are a biological farm and we produce white wine, red wine, oil, hooney, vinsanto and horticultural products). Furthermore we give our guests a notice (written in their mother tongue) with all the information for visiting the art cities closer to the farmhouse.